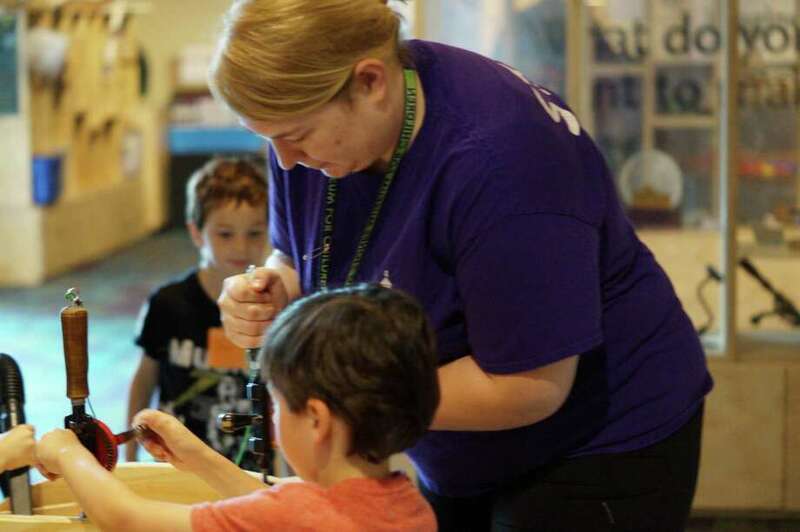 A staff member from Stepping Stones Museum for Children in Norwalk helps visitors use a hand drill as part of "Mega Making," a new exhibition that will run through Monday, Sept. 7. This summer will be a time to tinker, collaborate and “mega” make at Norwalk’s Stepping Stones Museum for Children, which has launched a new exhibition that calls on all ages to create. On a recent morning, visitors and a group of campers were doing just that, using real wrenches and screwdrivers to work on loosening and tightening rows of nuts and bolts, stringing yarn to make a design on a peg board and utilizing recycled material to create art. “Why I like this exhibition, as a whole, is that we have created a way in which visitors have just enough resources and materials to inspire them to make their own ideas into a reality,” Agans said. In other words, the only prerequisite is to come with imagination and then be inspired by the materials before you — the rest is up to you. The exhibition features stations in art, textiles, construction, woodworking, tinkering and gadgets, along with lots of different materials and instructions on ways to use it. All summer, staff will help visitors create original art, weave yarn and embroider, acquire woodworking skills and utilize common household tools, such as screwdrivers and drills. There will be opportunities to make sculptures out of colored paper, cardboard or felt. Small looms are provided for weaving and fabric waits for a few stitches. There are drills and clamps in the construction and woodworking area, too, for tinkering. The book nook features a famous Norwalk creation — Raggedy Ann. The character was brought to life in 1915 by the late Johnny Gruelle, an artist, cartoonist and children’s book writer who lived in Norwalk. Though he died in 1938, about 20 years after the first Raggedy Ann book came out, his creation lives on, and it can be seen in the books, dolls and other items on display at Stepping Stones, on loan from the Norwalk Historical Society. Organizers said they hope young people learn to experiment and improvise. The activities are aimed at fostering curiosity, experimentation and an innovative approach to problem solving. Agans said it is part of the maker movement, which encourages children to be creators of their learning, rather than consumers. It ties into the STEAM movement, too, which focuses on experiences that will encourage interest in science, technology, engineering, art and math. The hope is young people will be inspired to become the designers, engineers, inventors and scientists of the future.